Kerala is the dream destination of any nature lover. While the crystalline backwaters offer a golden opportunity to spend some quality time with your loved ones, the aroma of spices in the air rejuvenates your soul. The lush greenery all around is a treat to the eyes, while the taste of simple cuisines of the state lingers in your taste buds forever. Thekaddy is a popular tourist destination of Kerala due to its rich flora and fauna and pleasant atmosphere. 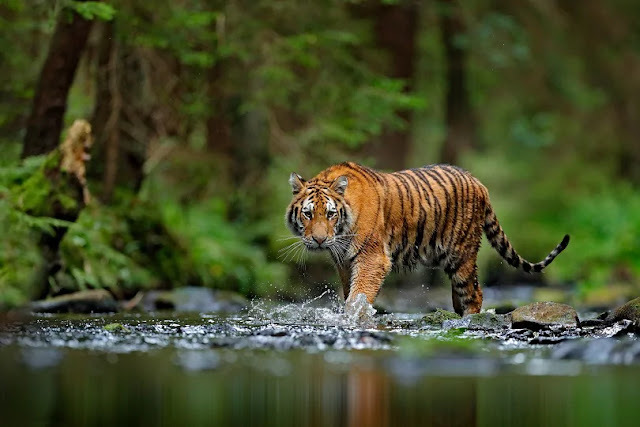 If you want to view the tigers closely, the sole tiger reserve of India, the Periyar Wildlife Sanctuary is a must visit for you during South India Tour. Located at an altitude of 700 meter, this forest reserve is the safe residence for tigers, elephants, wild boars, sambar deer, leopards, wild squirrels, monkeys and bison. The best part of this forest is that you can enjoy a water safari to explore the wild terrains. It is truly refreshing to boat over the mirrored waters of Periyar Lakes amidst tropical forests; lucky ones can also find herds of elephants bathing and playing in the waters of the lake. Wake to the fragrance of cardamom at the quaint town of Kumily. Walk through the green carpets of tea gardens or sip a cup of hot coffee with the locals to feel the true essence of life in natural surroundings. This picnic spot of Kerala is just at 5 km from Thekaddy. Embrace nature relaxing over the dew drenched grass of the valleys, nestled between the misty mountains, or gets some master snaps at the spice plantations of the place. Tourists can enjoy elephant rides here to travel through the plantations. Pack your bags and head towards Pandikuzhi to enjoy some fun moments with your loved ones. Trek through the hills to unravel the mysteries of nature or just sit and enjoy the gurgling sound of the nearby streams. A major trade center of cardamoms, this place gives you vivid information about spice cultivation. You can also buy back some packets from here. Deep dive into the ancient culture and traditions of Kerala at the 2000 years old shrine of Thekaddy, the Mangala Devi Temple, dedicated to Devi Kannagi. This temple exhibits the Pandian style of architecture. This temple opens once in a year, during the Chitrapournami festival and you require special permission from the authorities for visit. This place is quite different from the other parts of Thekaddy as you can learn martial arts here. Learn the art of self protection from world class masters at Kalari; as a visitor you can enjoy the performance in a specially designed gallery. Now if you are looking just for some solace, this quiet hill station tour is for you. While the bright flowers and rare wildlife of the place gifts you a rare experience, the natural bliss of the surroundings erases all your stress. The spirituality of the place also makes it a pilgrimage; the Sabarimala temple and the Makarajyothi celebration are worth a visit. Nature seems to be in a joyous mood at this hamlet of peace, with its swaying coconut trees, small mountain brooks, dancing waterfalls and massive stretches of green valleys. Hence there is no doubt about the fact that a trip to Thekaddy takes you to the abode of sublime beauty and serenity.